Movie night! 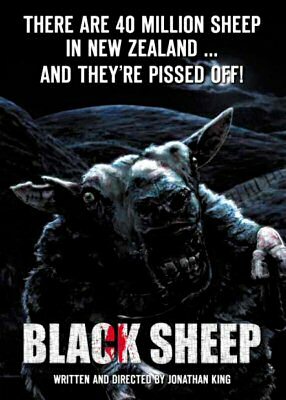 Tonight on the agenda was a flick called “Black Sheep”. I was searching for the classic Chris Farley comedy from 1996, but it seems the title was rehashed in 2006 for a very different type of movie; a movie about blood-thirsty zombie sheep in New Zealand. How could I resist? Naturally, a movie of this caliber requires popcorn. Thanks to the invent of movie theater “butter” popcorn is usually not considered health food, but I intend to change that. Corn is a whole grain, therefore popcorn is a whole grain. Popcorn kernels contains more fiber than an apple, a banana, 2 oranges or a serving of barley. The only problem is that the carbs in popcorn digest super-quick into your bloodstream, bad for people with diabetes or those watching their weight. Guess what dramatically slows down the digestion of these carbs? That’s right, nature’s perfect food: peanut butter. 1. If you have an air popper, use that. Otherwise, place a large saucepan on the stove over medium-high heat. Let pan warm for 1-2 minutes. 2. Pour kernels into the pan and cover with a lid. Using one hand to hold the pot and the other to hold on the lid (with a potholder), shake the pan every 5-10 seconds, while continually holding the lid down. Once all kernels have popped, remove from heat and pour into a large bowl. 3. Spray with olive oil or canola oil cooking spray and sprinkle 1t sugar on top. Toss popcorn, spray again and sprinkle remaining sugar on top. Drizzle peanut butter of choice across the top. To achieve the creaminess required for drizzling, I usually use Trader Joe’s natural creamy peanut butter w/ salt. If your peanut butter is not that runny, microwave it in a small dish for 15 seconds. Have you tried the traditional method using a pan and nothing else? All you need is a heavy pan with a lid, a source of heat and some popping corn. Did you know that although popcorn is a great source of fibre, it is very high on the glycaemic index, making it not a health food. However, what you’ve done by adding peanut butter is to moderate the speed which the starch enters your bloodstream, rendering it a little kinder and less likely to give an insulin spike. I read about the traditional method in a pan, but every place said you needed 1/4-1/2 cup oil. I will have to try that next time, thanks! As for the glycemic index, that’s interesting that it is so high. What that means is that blood sugar levels rise quickly, providing a very quick source of energy. This is a good thing for people who are active like myself. But for people who are trying to lose weight this may not be a good idea. The high glycemic carbs are absorbed quickly and don’t provide a full feeling for very long. But considering that the glycemic index of popcorn is about the same as oatmeal (my breakfast every morning), split pea soup and bran muffins, it can’t be terribly unhealthy. The fact that peanut butter slows the starch entering into the bloodstream only further proves my point that peanut butter is a wonder food. See, I knew Peanut Butter Popcorn was a healthy creation =). I think this may just be one of the most perfect recipes I have ever read! And to think you had me a popcorn! My husband taught me to put some kernels in a brown paper lunch bag and pop it in the microwave. Works just like the store bought brands! Then you can just season to taste! I have a hot air popcorn machine but it is at my parents house. I use a pyrex dish and cover (of course or else it goes all inside the microwave) and heat the popping corn dry in the microwave for about 8 minutes. You have to not cook for too long or else it burns. The hot air machine is better as there is no burning. I eat it au naturel with nothing added at all as that is how I like it! Christopher, England. Christopher, It takes 8 full minutes to cook it? Or do you just put it in for that long and wait until it stops popping? Do you have a microwave with a rotating table or non-rotating? I’m surprised it doesn’t burn and/or stick to the bottom of the pyrex dish! If you could make popcorn better, this is the way to do it. Looks awesome! I just used the same TJ’s pb in a peanut butter butter cream icing for a chocolate cake. Decorated w/ pb cups, of course. Best icing ever. We will definitely try this the next movie night. We’ve done melted chocolate and melted white chocolate — throwing creamy peanut butter in there will only make it better! Do it! Your hands will be a mess, but you won’t care. Oh man, you went there, didn’t you? 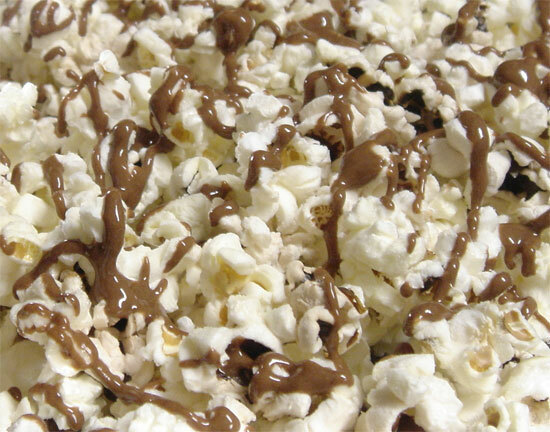 Chocolate and peanut butter on popcorn. Seriously, does it get any better than that? I would sit and watch Death Bed: The Bed that Eats People (it really is a movie, trust me) over and over as long as I had a big batch of this stuff to keep me occupied. Thanks for the great idea Nick. Popcorn will never be the same! That movie sounds fantastic. I would definitely require a gigantic bowl of this popcorn to get through it though =). Good luck on your super-sticky popcorn adventures thus forth! I’m from New Zealand and I love that movie! I also love the look of this kettle corn! Wow, someone else in the world has actually seen this movie? Haha, I really didn’t expect that! It was surprisingly good though! or sand. The way that the tour players make it look so easy on television is remarkable.